The same old story, Expatriate! : Roman' Around, Part Drei! 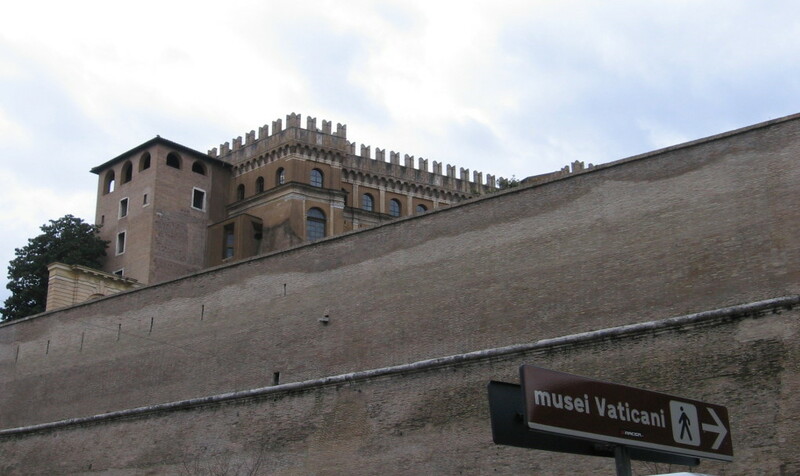 This wall protects the Vatican from Italian invaders. Over the years, the importance of religion -- and the height at which people hold it -- has waned in at least seven residents of the Western World. We can trace its decline to a variety of factors, ranging from poor PR in the form of wars, excommunications, bad communications, mass exterminations and unleavened bread. One of the ceilings in the Musei de Vaticani (roughly translated into Pope Hut), on the way to the Sistine Chapel. 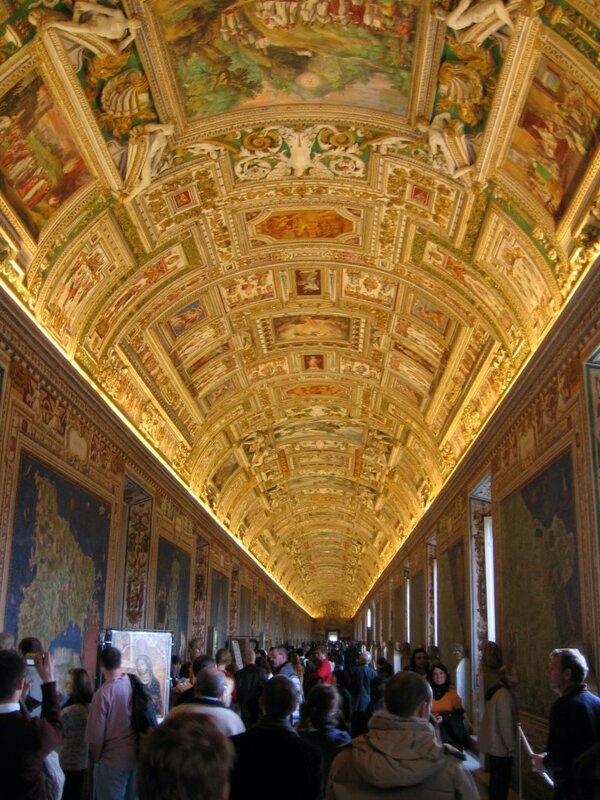 The final hallway before you get to the Sistine Chapel and are forced to turn off your camera by men who speak as if they are train conductors, with voices that bounce and bound around the room. But this, my friends, is the product of secular humanism. 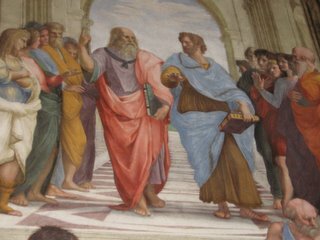 I really had no idea that The School of Athens was in the Vatican. Is this common knowledge? But, it was! And, pressed along an entire wall, it beamed. The colors, thanks to some welcome renovation, shot off the wall. But I ducked, so none of them hit me. 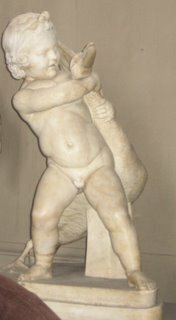 In this other product of secular humanism, a little boy beats the hell out of a swan (goose?). 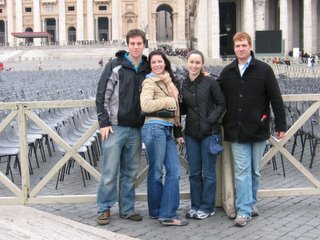 Ha, in the Vatican ... beats the hell out of ... ha. 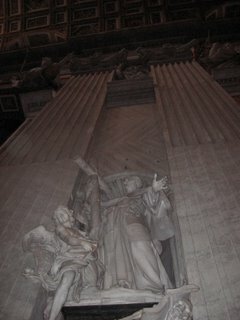 But the Sistine Chapel. I think what I remember most about it was the humility that rippled through me because of it. 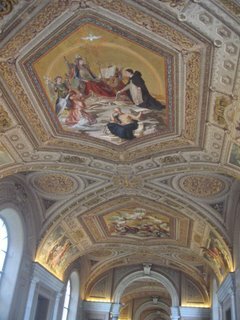 Whereas other things in Rome strike you because of their age -- and size, compared to previous mental projections -- the Chapel simply radiates brilliance. 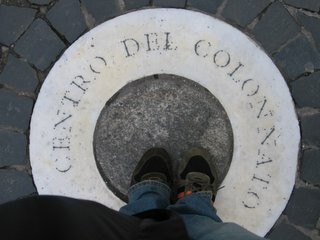 It's not a large place by any means, but it almost spins, covered in fresco. Adam sits above you, hand extended and limp, casually accepting God's offer of life as everything else around him seems to move. And it is everything around him. Not an inch of the Chapel goes unpainted. 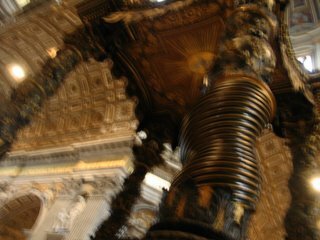 The curtains painted along the side sway in our perception while they remain stationary, as they have since Michelangelo first drew his designs. We turned our heads to the ceiling, imagining creating something lasting more than a few days, a few months, a lifetime. Something that meant something (and means something!) and something only comprehensible at direct glance, without aid of a medium or interpretation. 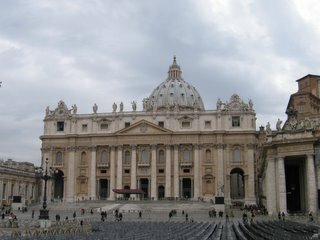 Lucky for us, a great majority of NBA players take up more space than the Vatican does, so we could make our way to St. Peter's shortly after picking up delicious pizza that may or may not have been blessed by the Pope. 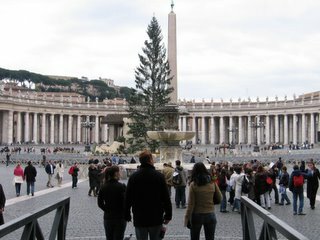 Three very handsome and worthy travelers traipse into the Piazza San Pietro, as one lags behind them to chronicle the mission and a very large Christmas tree races skyward with yet another obelisk. And there was this huge Christmas manger in the middle complete with ethnic wise men and a huge wreath that had to be held up by iron wire. By all means, it was a pretty sweet manger. I'm telling you. Japanese tourists don't get the art of background. Wowee wow wow! 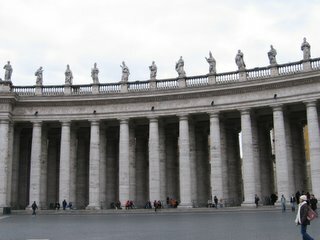 If you stand in this place, the three-deep columns all file into line, as if only one supports this huge arc that swoops alongside the South side of the Piazza. Emily showed us this because she's really great. 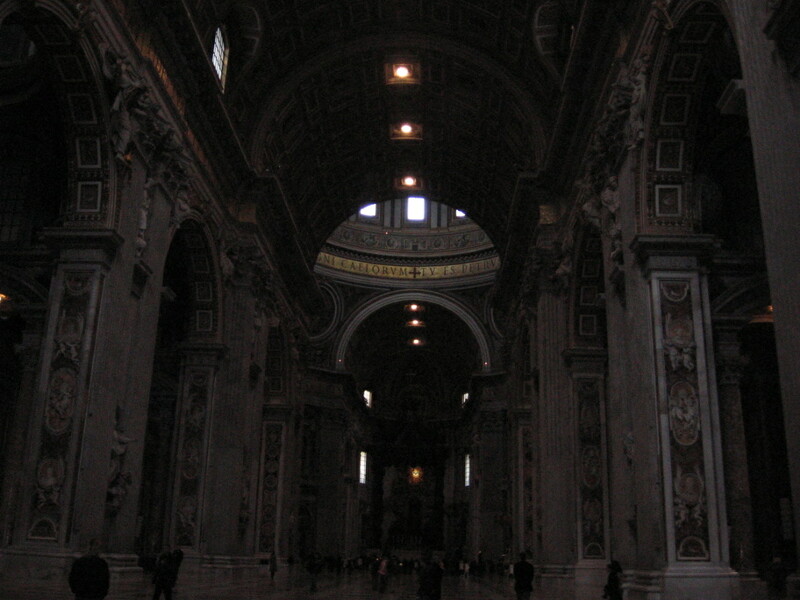 You want to see the inside of San Pietro? 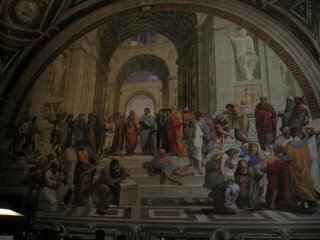 It's really big and full of paintings. 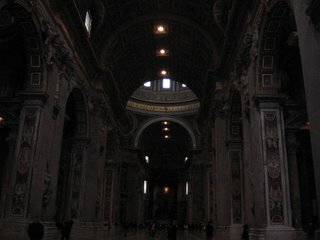 AAAAND A CRYPT where all the popes are entombed. I wonder if they're mummies. 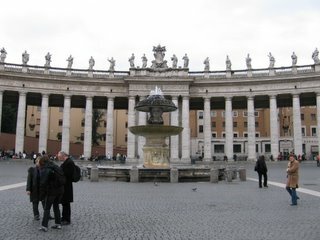 Alright you crazy kids (and Mom), we're gonna get to the wild and crazy antics of the night and Rome Wine Waltz in the last and final edition of this probably-too-long post of a journey. 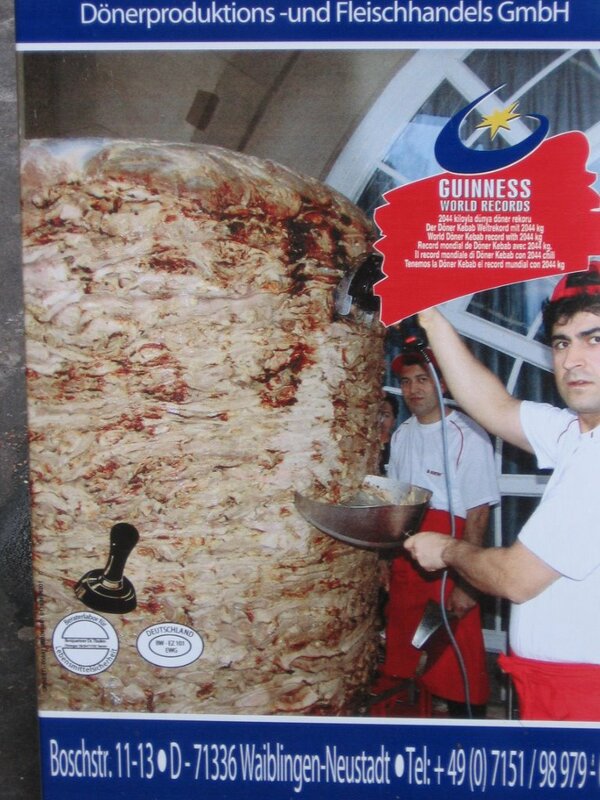 I promise that it will involve the following things: Joe Downer wiping out, belly full of Pinot, in front of the Pantheon as the Roman gods smote him for being irreverent.